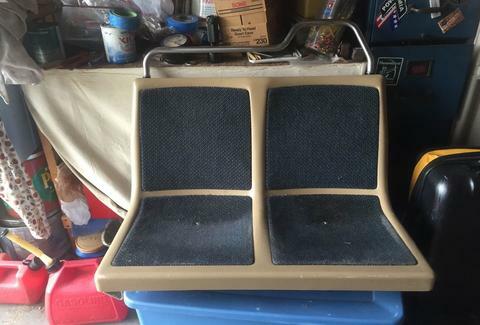 If in the unlikely event that you ever want to sit in those nice, undoubtedly clean CTA train seats for any longer than you absolutely have to, then here's some good news: it's now possible to purchase your very own thanks to this listing on ebay. Because who wouldn't want feel like they're stuck inside of a hot and sweaty Red Line car during a Cubs game in their living room, or at their kitchen table, or working from their home office? According to a description from the seller, the used bench seats would make for an awesome addition to your mancave, basement, coffee shop, salon, etc., and were originally acquired for a film set on a prop CTA train. As of Wednesday afternoon, bidding was at $105, which is probably a freaking bargain, considering the conversational value should you ever bring this thing into your home and tell other people about it. That is totally up to you, but first, we recommend some heavy-duty carpet cleaning action on that fabric and scrubbing whatever remnants of urine, vomit, and commute anxiety that you'd assume would still cling to it from typical use on a train. The auction ends on Friday afternoon, so if welcoming a piece of the CTA into your home is your thing, you might want to hurry up before someone else takes the seats ... you know, like on your way home tonight on the Brown Line. Foiled again. Update: The ebay auction is over and someone ended up paying $177.50 for the seats. Tony Merevick is Cities News Editor at Thrillist and does not miss the nightmares about what could be living in that seat fabric and is thankful for NYC's plastic subway benches. Send news tips to news@thrillist.com and follow him on Twitter @tonymerevick.